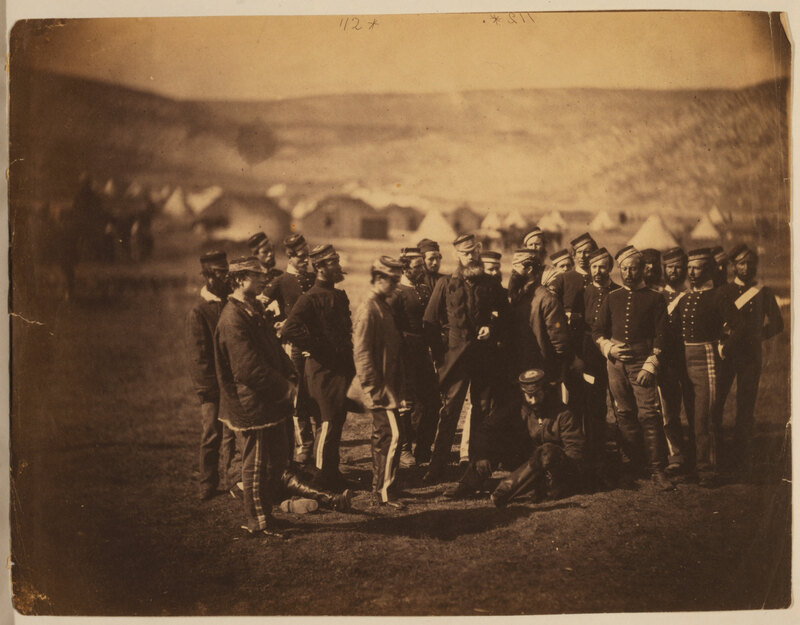 TWO PHOTOGRAPHS OF THE 13th LIGHT DRAGOONS IN THE CRIMEA, 1855. There are two versions of this photograph. I don't know which came first, but I've called them versions one and two. In version 2, the same young man is standing, further left. Another man is seated on the ground, right of centre, looking at a dog. He has a substantial moustache and mutton chop sideburns. In version one this man is standing, right of centre, looking left. He is smoking a pipe in both images. [PB: This key is presumably a clipped version of the one shown above. Only the top line is shown. 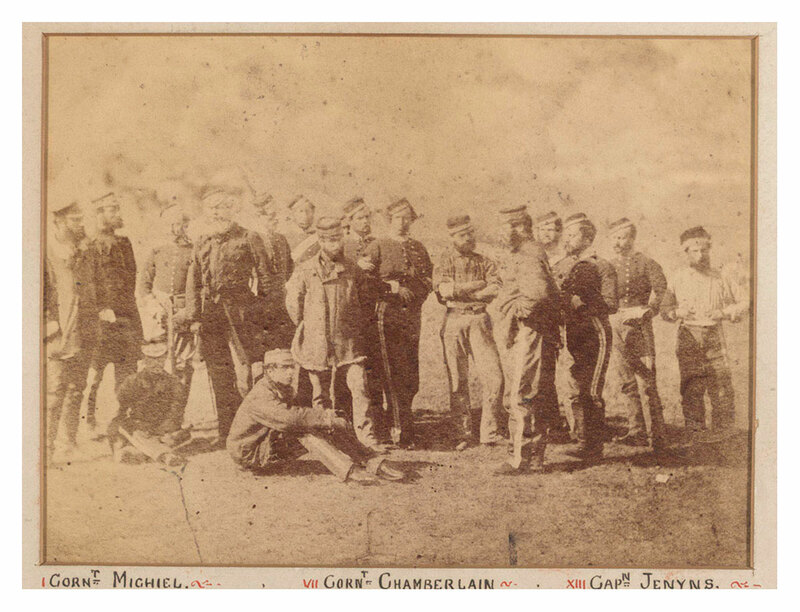 See also the page on Captain Soame Gambier Jenyns, 13th Light Dragoons, which looks in more detail at different versions of the photograph. In profile looking right in version 1, on the ground, centre, with spaniel, in v.2. [NB: There's a version from the LOC here >a href="https://en.wikipedia.org/wiki/13th_Hussars" target="_blank">Wikipedia: 13th Hussars. Direct link to image: https://en.wikipedia.org/wiki/13th_Hussars#/media/File:Fenton13ltdragoons.jpg. The keys are different, and both must be wrong. Agreement between keys is no guide to correct naming. For example, Sergt Major Linkon (Reg. 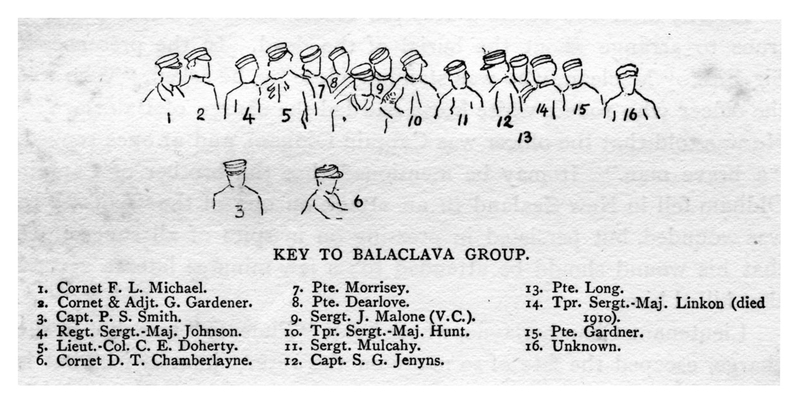 Hist.no.15), who is shown on both keys, could not have been present as he was a prisoner of the Russians at this time (mid-summer 1855?). He was released in October 1855. Photograph annotated with two keys. Above, the key printed in the Regimental History, p.363. Below, the NAM key. The Royal Collection's "further information" page follows the NAM listing (i.e. the lower name in the comparison of keys above], strictly left to right, with slight changes e.g. Chamberlyne is corrected to Chamberlayne, and puts brackets round "TSM Linkon" (Lincon in the NAM key), but with no explanation. Presumably this reflects the knowledge that it cannot be the POW Linkon. However there is no acknowledgment that this puts all the names into some doubt. 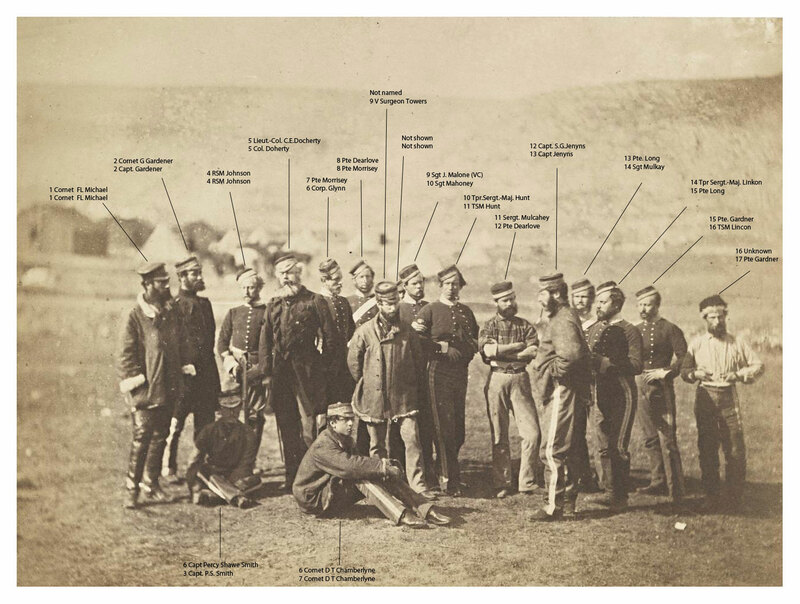 Photograph of a group of Officers and men from the 13th Light Dragoons, including Colonel Doherty. They stand in a variety of positions with two men sitting on the ground to the left. All are wearing military uniform and hats and some wear coats. Behind them is a campsite and a hillside. The 13th Light Dragoons served in all of the major battles of the Crimean War including the Charge of the Light Brigade. 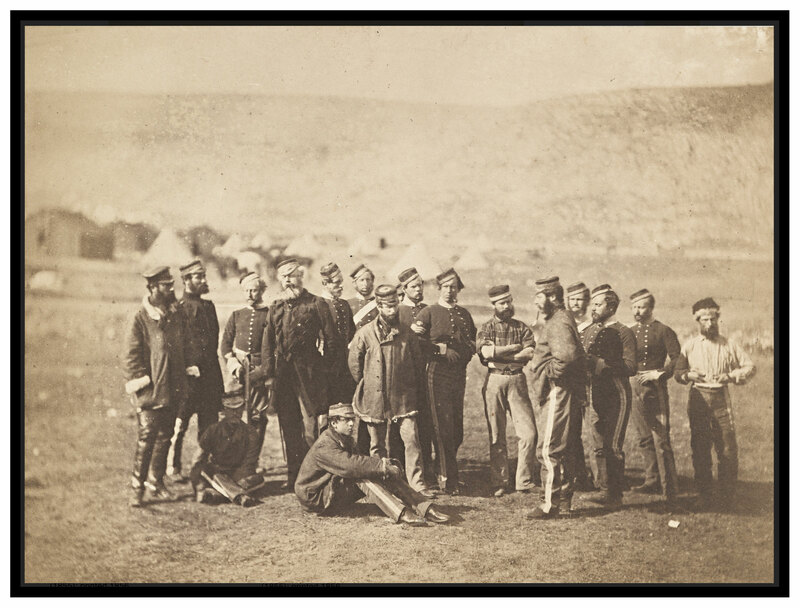 This photograph is sometimes captioned 'Remnant of the 13th Light Dragoons taken in front of their camp on the morning after the Charge at Balaclava, October 26th, 1854'. 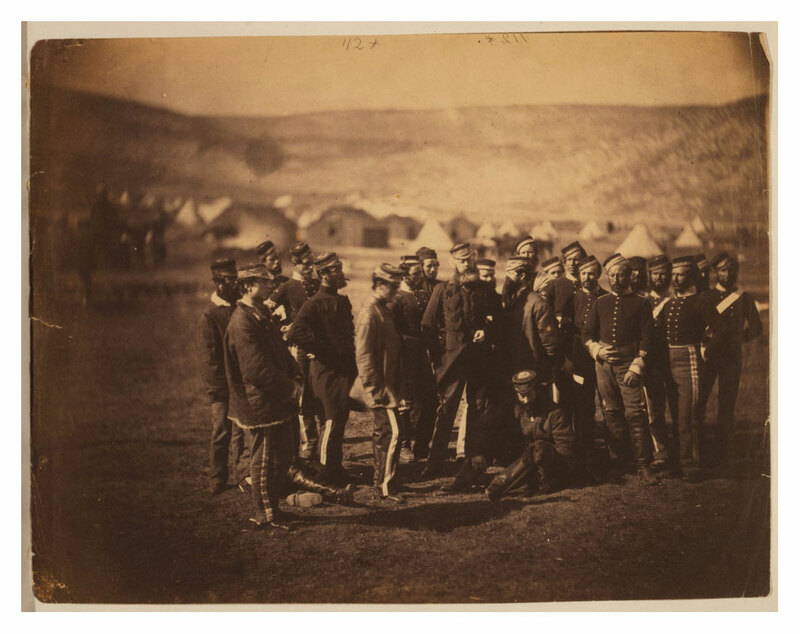 This would not have been possible, as Fenton did not arrive in the Crimea until 8 March 1855. A key held by the National Army Museum, with this photograph, identifies the men thus: Cornet F L Michael; Capt. Gardner; Capt. P S Smith; RSM Johnson; Col. Doherty; Corp. Glynn; Cornet D T Chamberlayne; Pte. Morrisey; V.Surgn. Towers; Sgt. Mahoney; TSM Hunt; Pte. Dearlove; Capt. Jenyns; Sgt. Mulkay; Pte. Long; [TSM Linkon]; Pte. Gardner. Jenyns was the most senior officer to survive from the 13th.